It has been fourteen years since the attacks on September 11th, 2001 took place, and American remembrance of these horrid events still have not wavered. In additon to the tragedy’s anniversary being recognized all across the nation, the Seneca Valley School District paid its respects in a plethora of ways this Friday. Patriot Day is the official name of the holiday that was put in place in order to “honor the innocent victims who perished as a result of the terrorist attacks of September 11, 2001,” according to President Barack Obama’s Presidential Proclamation in 2013. Days before Friday, Senior High School Principal Mark Korcinsky had told his students that certain events and ideas would be played out to further honor and remember what Patriot Day has come to stand for. Students arriving on Friday morning saw a towering American flag being hoisted by a local fire company. While students surely were prepared to pay their respects for those lost on September 11th, it was a surprise to anyone driving by the school to gaze upon the patriotic symbol before the school day even began. After first period began, an extended moment of silence was held in honor of those affected by the fateful day. At 8:46 A.M., Principal Korcinsky once again addressed the Senior High students over the announcement system asking for another moment of silence to be shared. This specific time was selected as it was about 8:46 A.M. when the terrorist attacks began in New York City. But Patriot Day isn’t solely about the attacks. In reality, what brave Americans did during and after the terrorism was deemed just about as important for students to learn about. Teachers were told to incorporate a piece of the September 11th attacks into their class’s curriculum for the day. While some teachers delved into the American heroics that saved lives during the attacks, others discussed how the unforgettable day related to their specific class. For instance, Science teachers spoke on the exact mechanics and reasons the event transpired the way it did; English teachers lectured on official government responses to the tragedy. Patriot Day would continue even after the final school bell rung on Friday. 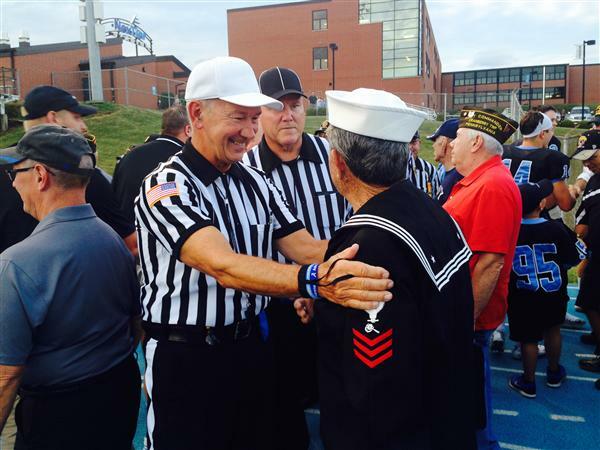 During the Seneca Valley football game against Fox Chapel, the school district hosted a “Veteran’s Recognition” night at Nextier Stadium. Both active and retired military personnel were celebrated. Seneca Valley regarded the veterans in a very positive way, saying “They have continued to live as good citizens in our communities, and the Seneca Valley School District salutes them…Thank you to all of our Veterans for your service.” on the school website. By the end of the day, Seneca students had thoroughly looked back on both the misery caused on 9/11 and on the triumphs that the American people accomplished against terrorism and fear. Even though the incredibly vast majority of the Senior High’s students were too young to remember the day as it happened, they are now old enough to truly grasp the complexities and emotions associated with Patriot Day.